The open access movement is a long-standing campaign in the world of research to make scholarly works freely available and reusable. One of its fundamental premises is that the progress of knowledge and culture happens scholarly works of all kinds are widely shared, not hidden in ivory towers built with paywalls and shorn by harsh legal regimes. Scholarly journal publishers currently compile research done by professors (for free), send articles out to be peer reviewed (for free), and distribute the edited journals back to universities around the world (for costs anywhere up to $35,000 each). Subscription prices have outpaced inflation by over 250 percent in the past 30 years, and these fees go straight to the publisher. Neither the authors nor their institutions are paid a cent, and the research itself—which is largely funded by taxpayers—remains difficult to attain. Skyrocketing costs have forced university libraries—even Harvard's, the richest American university—to pick and choose between journal subscriptions. The result: students and citizens face barriers accessing information they need; professors have a harder time reviewing and teaching the state of the art; and cutting-edge research remains hidden behind paywalls, depriving it of the visibility it deserves. The good news is that the open access movement is changing all this, and you can help. As scholars, researchers, and tuition-payers, students hold a powerful voice in setting the course for the future of knowledge. 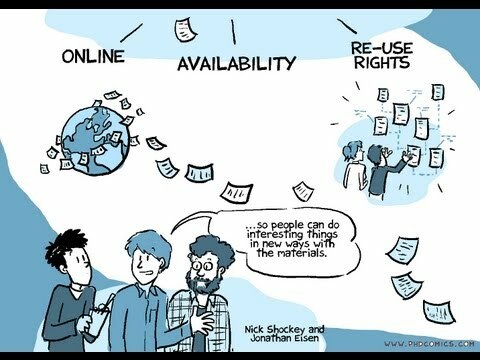 This eight-minute video is an excellent primer on open access, animated by PHD Comics creator Jorge Cham and narrated by U.C. Davis biology professor Jonathan Eisen and SPARC's Nick Shockey. It highlights all the major issues with the current scholarly publishing system, as well as the benefits of open access. It's fun, it's engaging, it's informative, and it's definitely worth sharing around. More often than not, university professors are both teachers and researchers. As authors, they control whether their articles will be openly available, and as faculty, they have the power to establish a campus open access policy. Reach out to them and let them know you care about open access. Send an email, grab them after class, or set up a meeting. Professors and librarians (and even administrators) are often willing to talk about the state of academic publishing since it defines such a big part of their lives. I am a student interested in learning your views on scholarly publishing and the open access movement. I believe that open access to academic articles is crucial to the progress of knowledge and is in line with our school's dedication to the public good. Many professors have made their works widely accessible by publishing in open access journals or depositing articles into repositories like PubMed Central, arXiv, and SSRN. Also, institutions like Harvard, Duke, and the University of Kansas have established strong open access mandates and funds to cover processing costs. I support a future where scholarly works are available to anyone around the world, and I would love to hear your thoughts. Are you free to meet in person to talk more about open access? Taking your voice to a public forum can be an extremely effective form of advocacy. School newspapers are around for just this purpose—and they're often itching for content. Open access affects everybody at your school, and an opinion piece or letter to the editor calling for change is sure to garner interested comments or emails. Here are a few examples: two from Harvard (one by student advocates and one by Robert Darnton, the director of their library); two from Yale (one general call to action and one written in light of Aaron Swartz' death—both, in full disclosure, written by myself); and an editorial from Duke. Explaining open access and calling for action in a way that appeals to members of your school's community—all within 700 words—is a task that requires some give and take. Before writing your op-ed, ask yourself, "What is the key point I want my audience to remember?" Narrowing the scope of your piece can help make your opinion more readable, approachable, and relevant. It may help to reach out to librarians for attention-grabbing facts, such as how much your university spends on subscriptions or the cost of your most expensive journal. If your institute doesn't have an open access repository, advocate for one where researchers and students can deposit scholarly works. An up-to-date list of current open access repositories can be found at the OpenDOAR project. Push for an institutional open access mandate, whereby professors grant your university the right to make their works publicly available via your campus repository. A list of institutions with open access mandates can be found on the ROARMAP project. Join a student group that advocates access to knowledge, such as Students for Free Culture and Universities Allied for Essential Medicines. A list of relevant student groups can be found at the Right to Research Coalition website. Sign up for EFF action alerts. We'll keep you updated about opportunities to support national legislation requiring free access to publicly funded research.